Swapping seats, with her in front, Bethany and Claiborne broke through a long prejudice against women. Blame me. 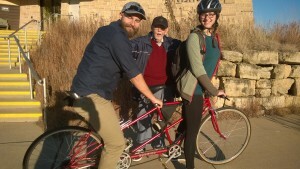 Madison, Wisconsin –I spotted a tandem bike with a couple on board. Of course, the guy was in front and the gal in back. It’s the usual. My son Mark, who teaches at the University of Wisconsin here, was driving me to his office. I’m visiting him and Stacie—a prof at UWI also– and my two grandkids. “Yeah, I suppose so.” He thought a minute. “But there’s more to it than that. There’s physics involved. Usually he’s bigger, she’s smaller. If they swap seats, the dynamics will be way different. The bike’s balance will be off. We went on to another topic. A day later I’m on the road with Mark again. We swing into the University Arboretum. One of the biggest and finest in the world—1,200 acres! He wants to show me its wonders. Right there in front of the impressive Visitor Center are a young couple resting on a tandem bike. He’s in front. She’s in back. Of course. By the way, have you ever seen different? “Mark,” I say. “Please leave me off here. I’d like to chat with those two while you park.” And I walk over to them. With a smile. She’s slim. Pretty. About 25. He’s big and muscular. Thick black beard. Three or four years older. A nice couple. I notice their bike is a Schwinn. “Yes,” and she smiles back. “Sure is.” And he gives a big nod. They look at one another. “No,” he says. “That’s just the way it is, I guess.” She just shrugs. By now I know them by name. She’s Bethany Ness. Between jobs. Was assistant manager in a coffee shop. Is looking for something better. He’s Claiborne Seier. Works in a bike and kayak shop. They’ve been a couple for a while. Ride a tandem now and then. They switch positions. She adjusts herself. I estimate she weighs 125. She tries the brakes. Wraps her fingers around the hand grips and pivots the front wheel. Gets the feel of it. The rear handle bar is rigid, of course. He has a harder time. “I’m an even 200 pounds, you know!” His seat—the rear seat now—should be higher. It’s a tight fit. He makes do. They start off. They’re wobbly. They head down a gentle slope. Now they’re riding better. Steadier. We watch them roll out of sight. They’re back in six or seven minutes. They haven’t swapped back. They pull right up. They just stare at me. Maybe they think I’m a nut? She smiles. I can see she’s less uncertain now. He’s not saying much. He’s thinking it over. But he’s accepting the idea. I see that. I tell them a bit about myself. Tell them I write a blog. Tell them I’d like to write this up because it’s such a positive and upbeat thing. They’re happy. I’m sure they’ll talk to their friends about this. We chat another minute or two. Then they take off. She’s in front and he’s in back. Wonderful! They’re doing quite well. “Me, too. But let’s hope they’ll be able to ride a bit before they have to confront that. You know, get to feel comfortable. If they’re uneasy, they can switch back to their original seats. Later, writing this, I have another thought. Maybe I can do something about that. I’ll send this to Schwinn. Be easy to do.